You're amazing! Let's prove it. It’s not like me to write a long article because I hate to read them. However, it didn't make much sense to write 2 separate articles. So, I asked Beyonce to help me keep you engaged. I wanted to provide as much detail as I could to avoid any unclear explanations, and I have done my best to avoid fluffy fillers and just give you the important stuff. 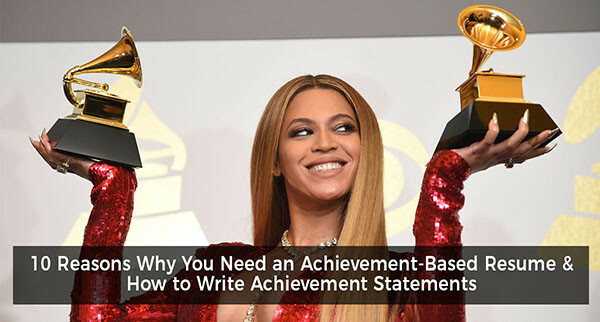 So, let’s dive right into Why You Should Have an Achievements-Based Resume. Number 1. Most employers can assume your responsibilities from your job title. For example, I know that a teacher likely provides instruction to a certain number of students, collaborates with fellow teachers, etc. I know that a cashier handles money, provides customer service, etc. Traditional resumes take this approach with several bullet points of regurgitated job descriptions. It's booooooringgggg. Number 2. General listings of job responsibilities do nothing to showcase who you are! Most people don’t feel like they are represented on their resume because they aren’t. Their jobs are. This leads to lack of confidence in the entire job search process. Number 3. It gives you a confidence boost. The vast majority of people who have achievement-based resumes have more confidence moving forward in their job search. They realize how awesome they are. They realize that they have done a lot to make improvements at their job…usually. Number 4. Providing achievement statements shifts the focus from what you do to what you have accomplished. It shows that you do more than just sit there at work. It can show your motivation to take initiative, go above and beyond, etc. Number 5. It sets you apart from people with similar experience. If 4 administrative assistants are applying for an executive assistant position, nobody will stand out if they all mention the same or similar duties. However, nobody else can say that they “Improved the efficiency of office operations by implementing a new organization system…” the way that you did. Number 6. You can adapt your achievement statements to include key words from job descriptions in order to perform well with those pesky online Applicant Tracking Systems (online job application software). Number 7. It gives employers a chance to see how you might perform before they even get a chance to meet you. This is the entire purpose for many employers asking behavior-based questions during interviews. I will go further on this topic later in the article. Number 8. You will already have several stories prepared for your interview. You just need to be able to articulate them in detail and adapt to the questions you are asked. Number 9. Some employers are expecting it now. Many HR professionals expect job seekers to adopt an achievement-based resume approach because it is easier for them to spot talent and soft skills. Number 10. It will show that you are paying attention to trends and working to be as competitive as possible in a largely competitive candidate pool. Employers are looking for you to tell a story about a past behavior. This is because past behavior is the best predictor of future behavior. They are analyzing each aspect of your story to grade your ability to perform in specific competency areas for soft skills like Communication, Collaboration, Decision Making, etc. and technical skills related to the specific job like Event Planning, Supervision, Financial Acumen, etc. Below is a guide for forming your responses to these types of questions or formulating your achievement statements for your resume. The situation/task or challenge may not always need to be explicitly mentioned. Sometimes it’s assumed. R = Results (what was the result of the action you took? What was the value added? * For your resume, flip your story for the most impactful reading experience. Lead with the results. This is going to capture the reader’s attention. Then follow the result by explaining the situation and how you achieved the result. As previously mentioned, sometimes the situation/task or challenge is inferred. You may have done something simply because you had extra time or felt the need to go above and beyond. Strengthened the bond of a divided team by planning intentional teambuilding activities, setting clear expectations, and cultivating a trusting environment between leadership and direct reports. Awarded Employee of the Month for consistently contributing to promotional events and receiving the highest rated feedback from customers. *The situation/task or challenge is assumed in this example. There are 2 things to keep in mind if you get stuck here. 1. Think outside of the box. Achievements are not just awards won, money earned, and increases in percentages. Ask yourself questions like, “What 1 thing are you most proud about in this role?” or “What did you fix about something that was not working when you first started?” Give yourself more credit and take time to reflect. This is something to keep in mind every time you start a new job, and there is nothing wrong with building your resume with achievements just for the sake of your own professional growth. It will ultimately help your employer as well. 2. If this part is that difficult for you, you may need to reach out to previous colleagues or supervisors to help you. You also may need to come to the realization that you need to be doing more. Follow Brett on social media!